A Black Forest Cake consists of a dark chocolate sponge cake which is super light and airy, usually split into three horizontal layers. Traditionally, each layer is soaked with Kirschwasser or Kirsch which is a clear colorless fruit brandy (double distillation of Morello cherries; which is again popular of the region) and sandwiched with generous amounts of whipped cream, pitted Maraschino or Morello (sour) cherries. It is further, fully covered, decorated and garnished with additional whipped cream, chocolate shavings or gratings and fresh cherries. Today the Black Forest Cake is re-created all over the world. There are several variations of this cake including eggless versions. Many are familiar with the traditional recipe, but Kirsch may not be easily available or may be expensive so the cake is either made without alcohol or other liquors may be substituted for soaking the layers of sponge cake. Maraschino and Morello cherries are very expensive and may not be easily available. So to enjoy this most wonderful piece of heaven, one has to substitute with whatever cherries are available. In Pune, quite a few custom notified shops and super markets do have good quality imported chocolate, Morello and Maraschino cherries. Some liquor shops do have Kirsch too. All these rare products are expensive and the stock is limited. I was lucky to get a jar of Maraschino cherries but it was not sufficient for the whole cake. So I bought another tin of cherries from a custom notified shop nearby, but when I reached home I realized he had given me a tin of locally canned cherries which were not pitted! I spent time pitting the cherries manually as I did not have a cherry pitter. I will keep in mind to use my reading glasses next time and henceforth not to have implicit trust for certain items. I also did not get Kirsch, so I used rum. This cake that I made was a labor of love. My family was proud of my achievement. I must tell you it tasted amazing and they could not get enough of it! They admired the cake for awhile but could not wait to dig into it. Phew! It was worth every bit of effort. 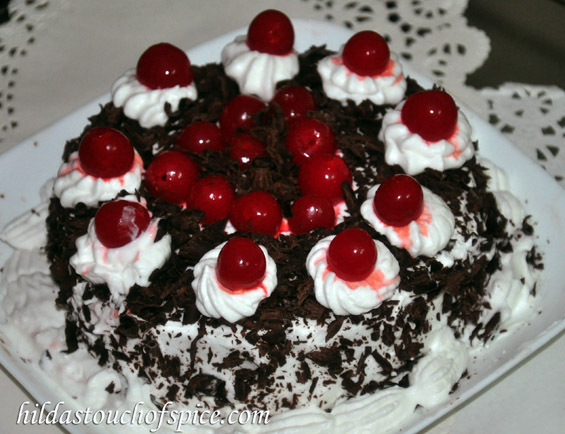 A Black Forest Cake is an ideal celebratory cake. I made this cake for my hubby for his birthday and decorated the cake with a sweet cherry heart which is also apt for your Valentine on Valentine’s Day! So here it is… my very first post this year to kick-start the preparations in anticipation of “Valentine’s Day”. 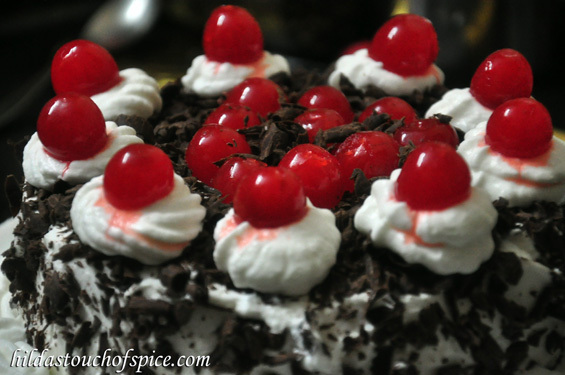 This is my tried and tested Chocolate Cake recipe for this Black Forest Cake. Fun Fact: The cake isn’t directly named after the Black Forest (Schwarzwald) wooded mountain range in Germany, but from the specialty liquor of that region, Schwarzwälder Kirsch. 1 ½ tsps. Baking pwd. Line two 23 cm. round cake pans with parchment or butter paper. Grease the paper and the sides of the pans well, dust with flour and tap out any excess. In a large bowl, sift the dry ingredients and combine. Add the eggs, milk, oil, vanilla essence and beat with an electric mixer/ blender for 2 mins. or alternatively, combine separately and then incorporate in the dry ingredients. If you intend mixing manually then you need to beat the ingredients longer. Add the boiling water or hot coffee and mix until well combined. Pour the batter evenly into the prepared tins and bake in a pre-heated oven at 180C for about 30-40 mins. or till a toothpick inserted in the center of the cake comes out clean. You can use one of the cakes to assemble the Black Forest Cake and use the other on another day or make two cakes or split both into layers and assemble to get an elaborate layered cake. The choice depends completely on your preference! I used one cake which I split into two and sandwiched it with whipped fresh cream frosting and cherries. Combine the above mentioned ingredients to prepare a syrup to brush and moisten the cake layers. In a sufficiently large pan, heat cherries with syrup, sugar and cinnamon. Bring to a boil, lower the heat and simmer for 5-7 mins. Add corn flour paste; stir to thicken and form a smooth clear mixture. Cool completely. Your filling is ready! When chilled, slice one cake in half horizontally or into four layers if using both the cakes. Place one layer of the cake on a firm board or plate. Brush with alcohol or prepared soaking syrup to moisten the cake layers. Spread the cherry filling evenly in the middle of the whipped cream ring. Place the next cake layer on top of the filling. Repeat this process depending on the number of layers you intend making; ending with the undecorated layer of cake for the top. Refrigerate to set. Frost the top surface and sides of the cake with whipped cream and reserve some for decoration. Fill another pastry bag with more whipped cream and use a large star tip to pipe a decorative top border. Place decoratively, maraschino cherries on top of the piped border or on the swirls. Arrange chocolate shavings decoratively on the borders and top of the cake. I used Maraschino cherries to create a heart on the top surface of the cake and placed a cherry on each swirl. Use your creativity to decorate and garnish beautifully. You may use fresh, pitted cherries with stems/ canned or candied cherries as per your preference and availability. You may use various chocolate decorations or dip cherries in melted chocolate. In case you decide to assemble the cake on the serving platter, then line it with parchment paper for a neat finish. Use of alcohol is purely a personal preference. You can substitute with vanilla essence/pure vanilla extract .